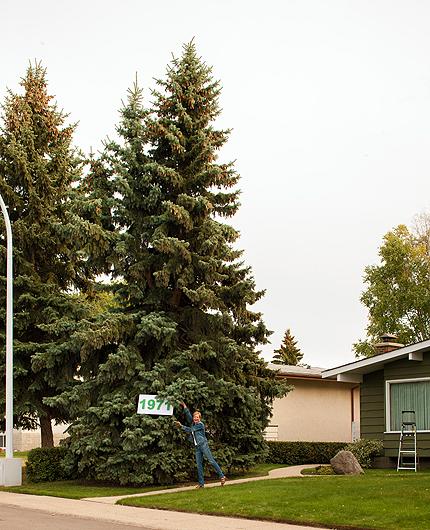 Today – 43 years after it was planted, my grade one tree, a lovely blue spruce, stands majestically in the front yard of my parents’ home. Over the years countless families of robins have chosen my tree to build their homes and raise their young. More recently, rabbit families take shelter under the heavy boughs making this their year-round home. Strong winds have played havoc with my tree over the years, but we keep it trimmed and watered in the hope that it will continue to grace the pathway to our door. The tree on the far right is also a grade 1 tree. It's owned by the family next door and planted in 1970. This photo shows how grade 1 trees have changed the landscape of the Duggan neighbourhood. The tree on the left of the photo (only partially shown) is also a grade 1 tree owned by Clement Yeung and planted in about 1978.